This is no trifling matter. Or maybe it is. When Central Perk, the fictional coffee house from the hit TV show "Friends," got its own real life counterpart, fans around the world were delighted. But now that we've learned there is a real-life version of Rachel's legendarily bad meat trifle dessert from the episode "The One When Ross Got High," we're over the moon with excitement. Custard? Good! Jam? Good! Meat? Gooood! This offer is no trifling matter. Or, maybe it is. UK food delivery service Deliveroo is behind the new invention they've dubbed the Meat & Sweet trifle, a dish that contains the classic combo of ladyfingers, jam, custard, raspberries, bananas, whipped cream ... and beef sautéed with peas and onions. Yum! In the episode, Rachel stumbled upon the sweet-and-savory disaster when the pages of her cookbook stuck together. "It tastes like feet!" cried Ross, but, of course, Joey loved the combination and devoured his full portion. Matt LeBlanc recently revealed that while his character thoroughly enjoyed the trifle, he accidentally ate some of his co-star's chewed-up trifle that had been spit out. Alas, you're going to have to do a little legwork to land one of the concoctions for yourself: They go on sale starting Friday, May 4 at 9 p.m. in London and Spain only "whist stock lasts," a Deliveroo spokesperson told TODAY Food. Of course, if you're feeling adventurous, you can always recreate the foot-like, savory dessert at home. 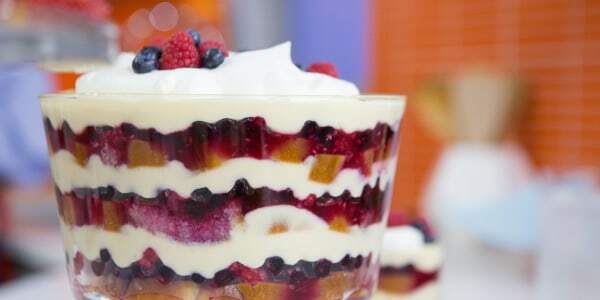 Try layering the ground beef filling from Padma Lakshmi's savory shepherd's pie with the cream, berries and cake in this decadent summery trifle recipe ... and enjoy!